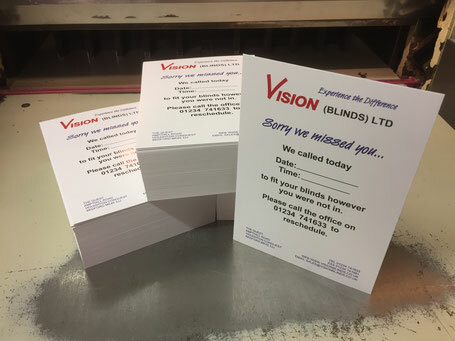 Card Flyers put to good use... - Easiprint Peterborough Cambridgeshire. One of our long standing clients approached us asking for a solution to their problem. Their fitters were attending appointments, but on occasions the homeowner was not in. This left the fitters leaving notes through letterboxes on scrap paper asking the homeowners to call the office to re-book. We mocked up a 'Sorry we missed you card' which our client loved. We printed these as A6 Flyers which were perfect for the job.